The Kremlin last Thursday announced the signing of a cooperation agreement between Russia and India to manufacture helicopters, though specific details of the agreement have not been released. Vladimir Putin said a “promising” direction was the joint development with India of a multirole fighter jet and a multipurpose transport aircraft. “We are not talking here just about the supply of finished products, but about close technological cooperation. One outstanding example of such cooperation is the creation of the BrahMos missiles, which have already entered mass production, and the anti-ship versions of these missiles are being delivered to the Indian Navy,” Putin said after his meeting with Modi. The total value of defence agreements was estimated at over $7 billion. A number of major contracts in the defence sector are likely to be announced in the near future. Russia has to deliver six multipurpose Su-30MKI fighter jet systems, which will be assembled in India. India plans to buy 222 such aircraft. Another major contract, for the supply of 151 multi-purpose military transport helicopters, the Mi-17V-5, has already seen delivery of 148 units. By the end of 2015, Russia and India should move from preliminary design to the basic design stage on two joint projects; the FGFA and MTA. Modern Russian-Indian cooperation in the defence sector is not just about the purchase of equipment on a simple “seller-buyer” contract, but works on complex joint development projects with participation of Indian public and private companies, and licensed production in India. “The sides reaffirmed their intentions to expand the scope of such cooperation and to use the opportunities offered by the “Make in India” program in the defence sector. They have instructed the appropriate agencies to prepare, as soon as possible, a draft agreement between organizations and enterprises of the two countries, working in this field,” said the official statement issued after the summit in Moscow. In 2014, Russia supplied weapons and military equipment worth $4.7 billion to India. According to CAWAT, Russia was the largest exporter of defence products to India in the period 2007-2014, selling products worth $22.41 billion. The main strike component of the modern Indian Air Force (IAF) is the multi-purpose Su-30MKI fighter jet, which will become more potent when equipped with the BrahMos supersonic cruise missile, jointly developed and produced by Russia and India. The ‘Vikramaditya’ Aircraft Carrier’s deck serves as a base for Russian-made MiG-29K/KUB military jets. The contract for supply of 29 such aircraft should be complete in 2016. Other important projects include in-depth modernization of aircraft delivered to India over the past years. The Russian Aircraft Corporation MiG (RAC MiG) will be upgrading the entire fleet of about 60 MiG-29s serving in the IAF. Russia has completed upgrading to the level of IL-38SD all anti-ship IL-38 aircraft in service in the Indian Navy. Discussions are being held on modernization of the Il-76 transport aircraft and the Il-78 aerial tankers. The Mi-17V-5s are the most widely used helicopters in the Indian Armed Forces. In addition to the nearly completed contract for 151 units, it is likely that another 48 helicopters will be ordered by India. The ‘Hindu’ daily newspaper reported in September that the Indian Defence Acquisitions Council had approved the purchase of 48 Mi-17-V5s for the IAF; a contract worth about 70 billion rupees ($1.1 billion). Another major project is production in India of 200 Ka-226T light helicopters. According to the draft MoU with the Indian company Reliance Defence, Russia is also holding talks with Hindustan Aeronautics Limited (HAL). Defence cooperation will peak in the likely purchase of the S-400 air defence missile systems by New Delhi. Russian anti-aircraft missile systems will be involved in five Indian tenders; MANPADS Igla-S, ADMS Tor-M2KM based on a chassis manufactured by Indian company Tata, anti-aircraft missile and gun systems Pantsir-S1 and Tunguska-M1. India has also shown interest in Russia’s proposal to “modernize the Indian Army’s S-125 air defence missile systems to the level of Pechora-2M. Russia is also proposing an upgrade of existing mobile short-range air defence missile system Strela-10M3 to Strela-10M4 or Strela-10MN (night-version). While India is actively working to build its own short-range air defence system, the Akash, the country’s air defences are based on Soviet/Russian systems; Osa, Strela-10, S-125, S-200, Kub (Kvadrat), and so on. The main “fist” of the Indian Army is formed by Russian/Soviet armoured vehicles. This consists of several thousand T-90 and T-72 tanks, and about 1,500 BMP-2s. Moscow and New Delhi are fulfilling a contract for licensed production of T-90S tanks in India. Negotiations are currently underway on a contract for supply of the newest Russian tanks, the T-90MS, the latest export version of the T-90. Also being discussed is the issue of modernizing India’s existing fleet of T-72 and T-90 tanks. Other possible projects include modernization of all Indian BMP-2s. The most powerful multiple launch rocket system (MLRS) in the Indian Army is the Russian 300-mm ‘Smerch’. Negotiations are on for licensed production of shells for the ‘Smerch’. Delhi will discuss the purchase of two Project 636 submarines and also wants to lease a second Russian nuclear submarine (after the Chakra that was leased in 2012). India is keen to use Russian nuclear submarines to gain experience of their operations, for its own nuclear submarines of the Arihant-class. Russia also plans to participate in the 75I Tender, for purchase of six submarines for the Indian Navy, with its Project 1650 Amur-class vessels. New Delhi is looking at possible construction of three more Russian Project 11356 frigates. Six of these ships were built earlier in Russia and transferred to India. The second batch of ships has been equipped with BrahMos missiles. Another area is cooperation on aircraft carriers. In 2013, the Indian Navy received the ‘Vikramaditya’ carrier from Russia. 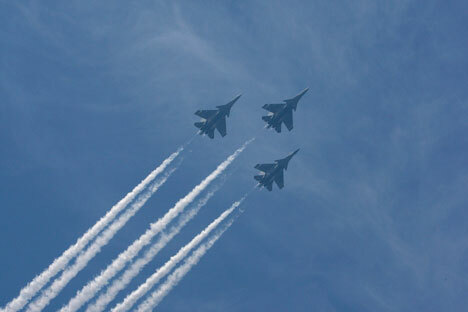 To prepare pilots flying the Russian MiG-29K/KUB, Russia is helping to build a ground training facility in Goa. Pilots will train on take-offs and landings in simulated carrier-based fighter jets. India is currently building its own aircraft carrier; its first; the ‘Vikrant’. RIA Novosti learned from Sergey Vlasov, CEO of the Nevsky PKB, that specialists from there are working to develop aviation-technical equipment for this ship. Vlasov said PKB is also keen to work on building the second Indian aircraft carrier, the ‘Vishal’. One of the most successful joint Russian-Indian projects is the BrahMos supersonic cruise missile, now in service on surface ships of the Indian Navy. BrahMos launchers are now being delivered to Indian ground forces. They are preparing to test the air-launched version (using the Su-30MKI), the first of which should be launched in early 2016. BrahMos missiles are also being prepared for submarines. Six diesel-electric submarines, which India plans to buy, should be equipped with BrahMos. Russia and India are also considering the possibility of building a miniature version of the rocket – a “mini-BrahMos”, and a hypersonic version of the BrahMos.